Securing a PDF file using a certificate is a reliable way to limit the scope of persons who can access the document. 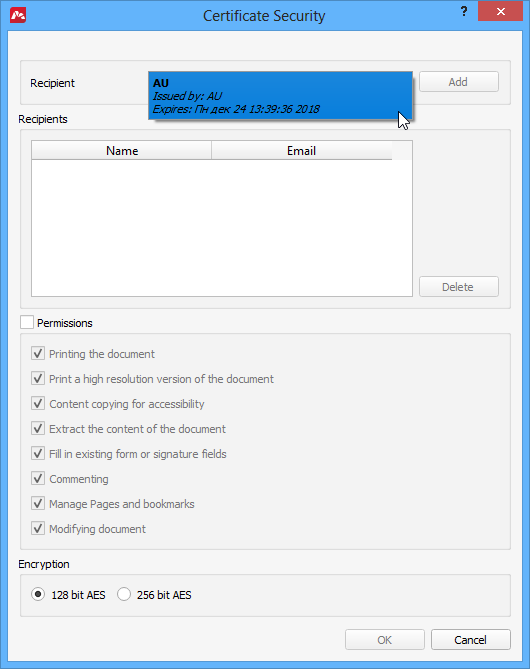 The encrypted document will only be accessible by recipients whose certificates are explicitly included to the list of valid recipients for this PDF document. Make sure the required certificate is imported to your local certificate storage. You can check all the imported certificates in Certificate Manager. To open Certificate Manager, click the Tools > Parameters menu and switch to the Certificates tab. Note: in order to use a certificate for encryption, that certificate must include a public key. Click the File > Properties menu and switch to the Security tab in the Document Properties window. In the dropdown box select Certificate Encryption. A Certificate Security dialog opens. In the Recipient dropdown box select a certificate you want to add to the recipient list, then click Add. The list displays all certificates that include a public key. 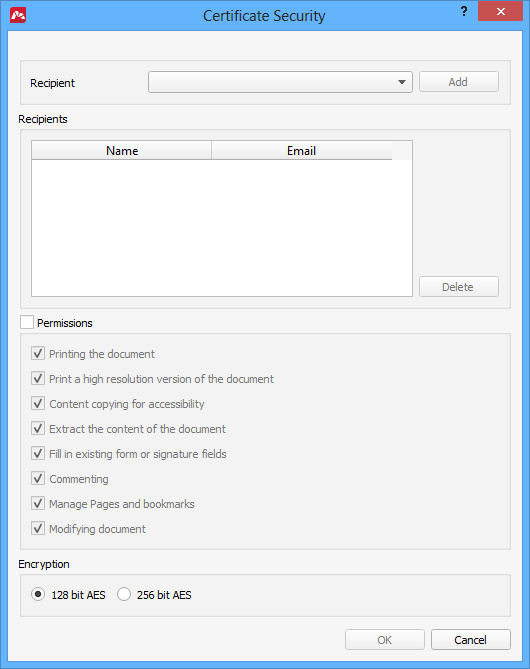 Add all recipients that you want to be able to open this PDF document. IMPORTANT: Make sure to add your own certificate too in order to be able to open the encrypted PDF document yourself. Adjust permissions. If you want to limit the scope of actions allowed to perform in the PDF document, turn on the Permissions option and select which actions are allowed.